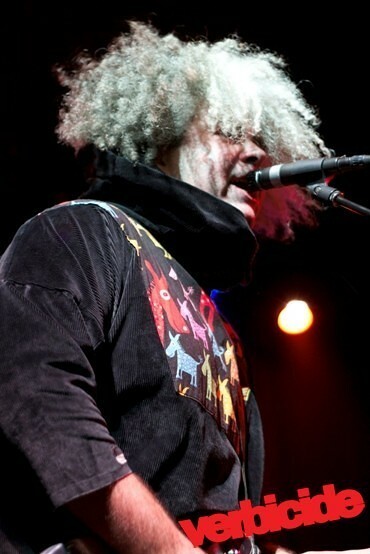 The Melvins have roots in the Olympia area — the band formed in the early ’80s in Montesano, Washington, a small town near the coast that’s less than hour away from Oly. 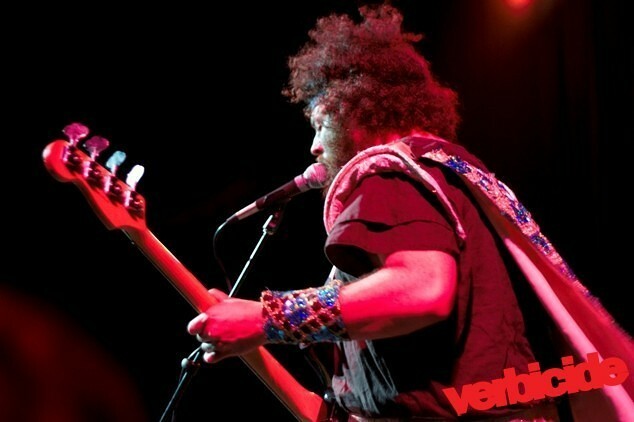 At the all ages show at the Capitol Theater on a Wednesday night, fans ranging in age from 15 to 92 came to watch Buzz’s giant gray afro thrash under the lights — and they were not disappointed. Los Angeles’s Totomoshi played a warm up set, and after that I managed to sneak my way up front with my camera. Excited little butterflies hopped around in my stomach as I peered over the monitors at the two drum sets that the roadies were setting up. I knew I had a good spot and couldn’t wait to hear the thunder those puppies would produce. 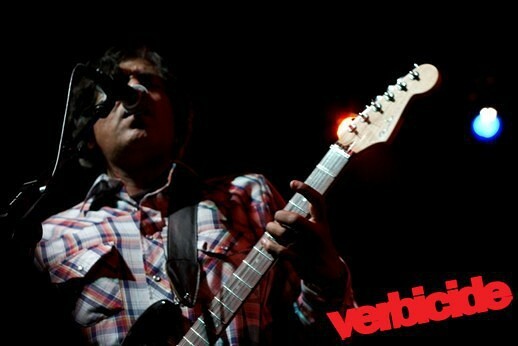 After a few minutes Buzz appeared on stage. I had underestimated just how good of a spot I had. He was standing right in front of me — I could literally reach out and touch his toe if I felt like it. 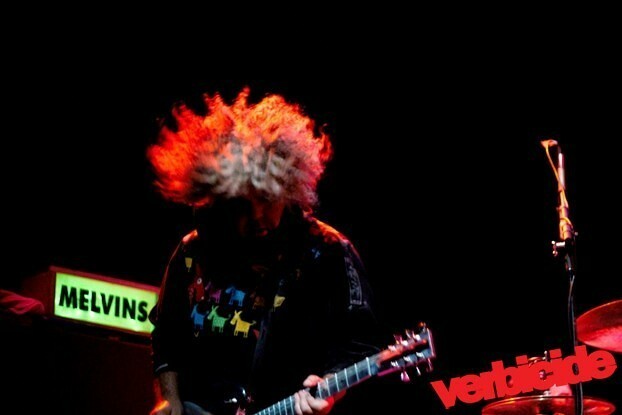 The Melvins got the crowd going with “The Water Glass” off their latest record, The Bride Screamed Murder. The call and response part of the song (“We are ready/rock me steady”) got everyone immediately engaged. I sang along with the crowd and marvelled at the strange D&D cosplay outfits the band was wearing. Buzz had on a black mumu-looking costume that resembled a priest or mage’s robe, and Jared was wearing a Liberace-style sequined cape, a headband, and an armored skirt. The drummers wore similar garb, looking like warriors from Gauntlet — I wondered what was going on there. Buzz tore at his guitar with delicious violence — he looked as though he would break the strings with every chord. As he bobbed and thrashed his head about I watched little fuzzy gray hairs fly through the air, backlit by the stage lights. 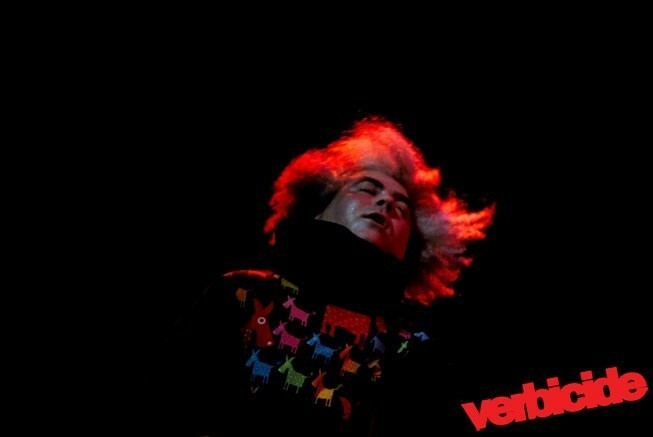 I had seen the Melvins before, but I had never experienced a performance up close. It was incredible. As the show continued I unfortunately had to leave my glorious spot. Predictably, the pit was becoming crazy and I didn’t want my camera to end up in little pieces. Legs flew up in the air as crowd members surfed toward the stage. 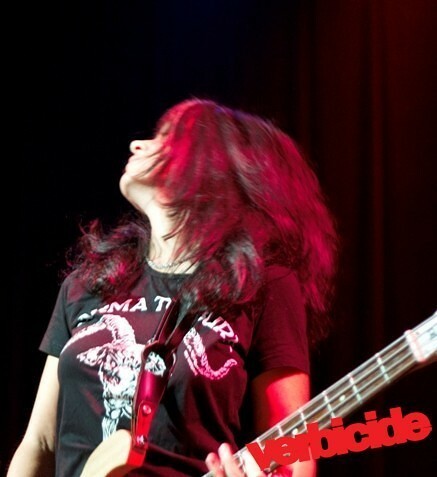 Bodies surged forward with each thunderous crash of the drums, crushing me against the stage and the monitors. Now that’s what I’m talking about. Buzz, you rule. I was happy to make room for you next to the stage for your pictures. Loved the show, made it all the way to the end leaning on the stage although I thought I would give up also. When they played with Jell Biafra or when they played with muddhoney I couldn’t stay up front. Maybe I’ll see you at the Gosip show during Oly film festival.